New coffee-flavored products, fruit preserves, and 85 degree heat in the northeast? What season is this anyway? Even the fall foliage is behind schedule. If this pattern keeps up, we'll be celebrating harvest time in December and all these corn mazes and hayrides will feature Santa Claus instead of scarecrows. But enough complaining...for now, anyway. 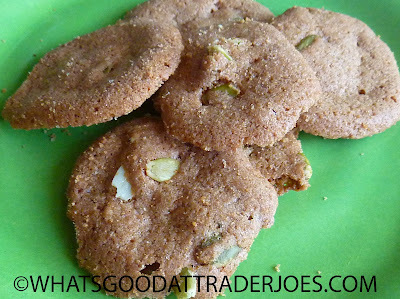 These cookies are decent enough snacks to curb my pumpkinsatiability into next week at least. They're a lot like those gluten-free cookies we checked out last year, but with pumpkin spice instead of ginger...and gluten instead of...not gluten. If I weren't looking at the ingredients list right now, I might assume that this was rice flour instead of wheat. But I'd be wrong. Hey, there's a first time for everything. This is the crispiest wheat flour I've ever had. Sonia thought the cookies were going to be salty and not necessarily sweet since, you know, pepitas tend to be present in salty stuff. But she was wrong. But that didn't surprise me since she's wrong all the time. So yeah, like I was saying, these cookies are indeeed...well, cookies. So they're sweet, slightly buttery, and pumpkin spicy. When I eat more than two or three at once, I get the faintest warm tingly sensation at the back of my throat from the pumpkin spice. It's not altogether unpleasant, but it's a little unusual for a cookie. The pepitas add some extra crunch and a hint of nuttiness—but they don't even come close to being a dominant flavor. 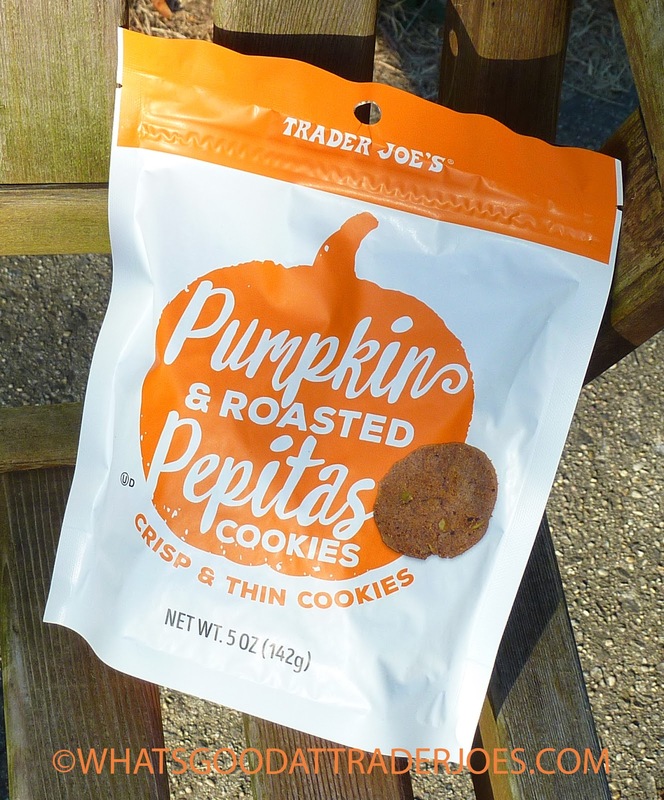 If you like pumpkin spice and thin, crispy cookies, these should most definitely go on your shopping list. I'd love to try a soft version of this recipe some day. You'll pay $2.49 for a five ounce bag that your family will probably go through pretty quickly. Three and a half stars from me. Sonia gives them four. Meh. I don't want my cookies to shatter, there's crispy and there's *too* crispy. The flavor didn't wow me either. I'll stick to my all time favorite triple ginger snaps for a sturdy crisp cookie with serious spice and flavor. I enjoyed these. Got a second bag on my trip today. I love these! I would buy them again, and hope they come back next year.